Synthetic reed with composite design. 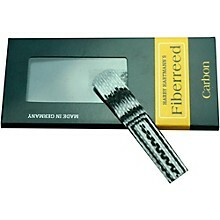 Harry Hartmann's Carbon Classic Fiberreed for Clarinet Boehm. The construction of this reed features a superior hollow fiber layered with carbon fiber for strength, durability and consistency. It has the feel of a thicker classic cut reed and features a warm dark low end, as well as a brilliant high register and altissimo range.